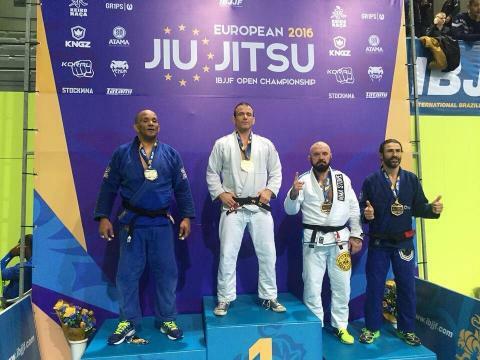 UK athletes are celebrating success after making their mark at the IBJJF European Open Championship, including the top ranked UKBJJA (UK Brazilian Jiu Jitsu Association) sponsored competitors. The UKBJJA awarded sponsorship in the form of a travel package to the top ranked male and female athletes of each belt category in the UK. White belt Henry Timson won his first two fights, blue belt Ashley Amos took silver after winning three of his four fights, purple belt Sean Coates also had two wins and female purple belt Kat Hill lost in the quarter finals to the eventual gold medallist. Kat Hill, CEO of UKBJJA, pictured at the event. She said: "It was a close thing, not my day but these are the best girls in the world and I will be going to Pan Jiu-Jitsu IBJJF Championship in March". 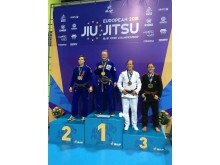 White belt Kyra Robinson, who took gold in the Medium Heavy division, said: “The experience was amazing, the team support, the atmosphere and obviously coming away as European champion was pretty cool”. Kyra had two fights, explaining: “My first fight was the toughest I've ever had and finished with me 5 points up. The final was very fun I armbared my opponent from knee on belly. The whole experience was really fun, a lot of energy was taken out of me but it was worth it. Watching my teammates fight and watching legends compete was amazing”. 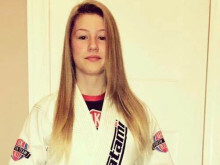 Speaking of competing at high such a high level, Kyra added: “It's really pushed me mentally and given me confidence, I will be going to as many big IBJJF competitions as I can this year, with the funds I have. I will definitely be going for the big golds”. The 18-year-old concluded: “I would encourage anyone with the desire to challenge themselves and compete at a high level to do so. Why not? Win or loose your jiujitsu can only get better and the more experience you get the better you will become”. Brown belt Viking Wong lost in the quarter finals and Lagarto brought home silver in the Black Belt Super Heavyweight division. 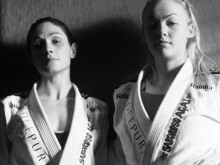 Brown belt Leoni Munslow, pictured above on the far right, was supported by the UKBJJA in getting to the landmark event on every BJJ athletes' calendar for the year. Leoni brought home a Bronze medal having fought in the Lightweight division. 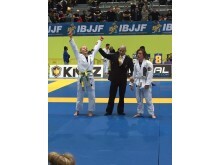 Jane Kotckhina (pictured above) brought home two bronze medals from the Blue Belt Medium Heavyweight category and the absolute division. She said: “I absolutely enjoyed the experience, the whole team was there, we supported each other and screamed our heads off for our teammates, especially Kyra Robinson who was with me the whole time having won Gold in her category soon after we arrived. My coaches were there for me and I had Sarah Merriner by my side as I wanted and Dickie was also holding the spirits up. Jane had three fights in her weight division, winning two by bow and arrow submissions and losing the third on points. Commenting on the event itself, Jane said: “It ran on time and people knew what was happening, so I was pleased with the way it went. Staff were supportive and made the whole experience less intimidating.It doesn’t get any bigger than this, but I must admit that after my fight at the Worlds was three and a half hours late I promised myself to never again do Worlds. However, the way this competition was run gave me confidence that Worlds may be more timely this year”. She added: “I think that once you’ve done a few competitions in the UK and start achieving good results, it is great to go for a big IBJJF comp to show your skills at a larger comp”. Partners of the UKBJJA and sponsors Faixa Rua, Idee Pure, Rainha Fightwear, Saboroso Acai, Break, BJJ Style, Saiko Apparel, Sulston's Kitchen and Physical Being helped send the top ranked athletes of the UK to the huge event. 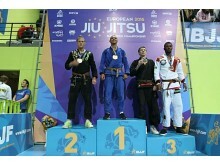 Another four athletes were able to compete at the competition following donations made at charity seminars taught by Black Belt Oli Geddess, coordinated by the UKBJJA. These included Samantha Cook, who took gold in the Female Adult Middleweight Brown Belt category, Jamie Hughes, who won Bronze in the Adult Male Heavy Brown Belt division, Luke Costello who took Silver in the Adult Black Belt Ultra Heavy category and Bryn Jenkins, who brought home Silver in the Purple Adult Middleweight division. UK competitors who brought home gold medals include Samantha Cook, Carlos Santos, Alister Tweed, Rogerio de Lima, Phil Ounsley, Paul Davies, David Minto, David Mannering, Dave Knight, Valmyr Neto, Lewis Hayes, David Onuma, Paul Malcolm, Dickie Martin, Liam Corrigan, Don Macintyre, Michael Greenfield, Bryan O'Neil, Carly Hall, Sam Schilder, Stuart Pyne, Jason Goddard, Ffion Davies, Angus Hewett, Kyra Robinson, Mark Case and Michelle Lutley. 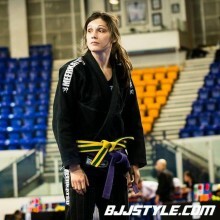 Purple Belt Ffion Davies (pictured above) won all four of her fights in the Lightweight division by submission and had no points scored against her. The 21-year-old from Swansea lives in Cardiff and has been training BJJ at the Rob Taylor Academy Cardiff for two and a half years. 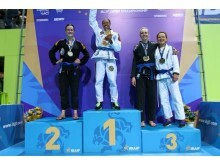 She said: "I'd love to compete at the World Championships this year if I can afford to and try to win, and my next competition is the IBJJF European No-Gi Open". Chairman of the UKBJJA Dickie Martin won double gold at Master 4 Black Belt Heavyweight and in the open weight absolute. He said: “I am very happy with my performance and results at the European Championships, double gold is always the target and five submissions in six matches made it nearly a perfect weekend, especially as I didn't have a single point scored against me in any match”. Dickie, who competed in the Master 4 category for athletes of 45-50 years of age, added: “It is always particularly satisfying to win the open weight category and beating a 130kg opponent was one of the best competition performances of my career. I am also very satisfied with our team performance as Carlson Gracie Team secured a podium in the team points for masters athletes (30 years and over) and also we had an athlete (Sam Gibson) on the podium in the elite, adult black belt division for the first time”. 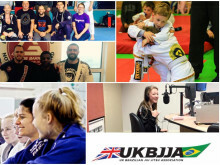 Speaking of the UKBJJA sponsored athletes, he commented: “As Chairman of the UKBJJA it made me very proud to see the top athletes in the UK performing at the highest level, with an exceptional performance from Kyra Robinson who secured a gold medal in her division, Ash Amos who won a silver and Leoni Munslow a bronze. All the athletes fought well and represented the UK admirably and we continue to progress together. I hope to see continued growth in the sport over the coming year and increased professionalism and higher achievement for all teams and athletes”. 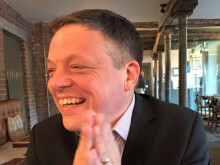 Dickie also spoke of the work the UKBJJA is undertaking to apply for Sport England recognition: “As we come nearer to Sport England recognition, we are close to securing a bright future for BJJ in the UK with the potential for inclusion in high level competitions such as the Commonwealth Games and increased participation as Brazilian Jiu Jitsu becomes a mainstream sport”.